I've always been a fan of Ellen Degeneres. Her brand of observational humor and friendly personality has made her into one of the biggest stars of daytime television. Her book, Seriously...I'm Kidding, is an odd little collection of her musings on life, love, her career, and everything in between. One chapter, a reproduction of entries from the journal she started just before the first episode of Ellen, reveals the author's excitement and anxiety at starting her own talk show. Amidst the highs of success came equally important failures such as short lived sitcoms and a brief stint as a judge on American Idol. Ellen writes, "My point is, life is about balance. The good and the bad. The highs and the lows. The pina and the colada." While these personal reflections are quite engaging, some of the other chapters are less successful. Many sections feature Ellen's musings on seemingly mundane things that read like extractions from her stand-up monologues. Without the nuance of Ellen's verbal delivery, the written words come off flatter than the comedian intended. Yes, I found myself chuckling at several of the punchlines, but I also think I would have gotten more out of the audio version of this book. Overall, Seriously...I'm Kidding is a funny but uneven collection that will probably divide readers. 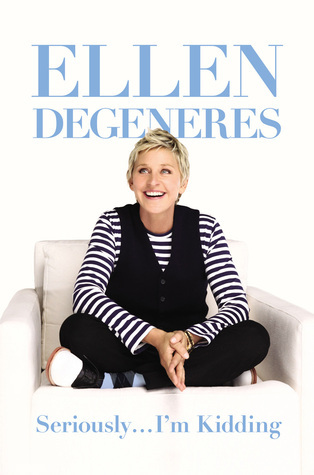 I enjoyed this short read, and am especially appreciative of Ellen's positive outlook on life. Even if you don't like her humor, there is no denying the good that Ellen has given to the world. Her decision to live life exactly as she wants to and encouragement to readers to do the same is the ultimate takeaway from this book. This entry was posted on Thursday, January 14, 2016 and is filed under Comedy,Ellen Degeneres,Memoir,Seriously...I'm Kidding,TV. You can follow any responses to this entry through the RSS 2.0. You can leave a response. I'm not really a big fan of Degeneres. I have seen a few episodes of her show but I don't really find it too humorous or funny so I guess her humor just isn't for me. I do think she has a friendly personality though. It sounds like this one is a mix, but it sounds like you mostly enjoyed it! That personality definitely shines through in this book!